Every maker has a story. Be a part of Train Tables Online's story by placing an order, leaving a review, and seeing your review appear here. 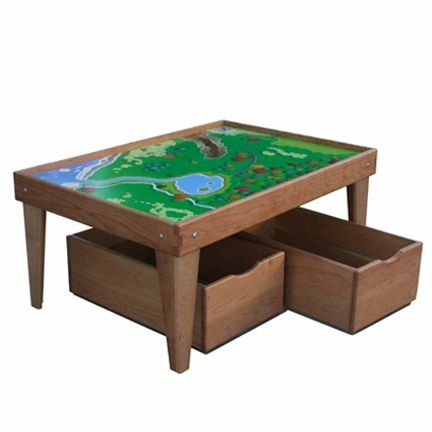 This complete cherry train table and storage bin package is perfect for your little or big engineer. Use for Thomas Wooden Train or N-gauge and Z-gauge electric trains. It is hand constructed from solid cherry hardwood. The top has multiple options including the shown Thomas Island Adventure Playboard. Other top options include solid cherry top or a cherry plywood top. Both are available with a hand rubbed hard finish so it will maintain it's beautiful look. This table is currently available to purchase.